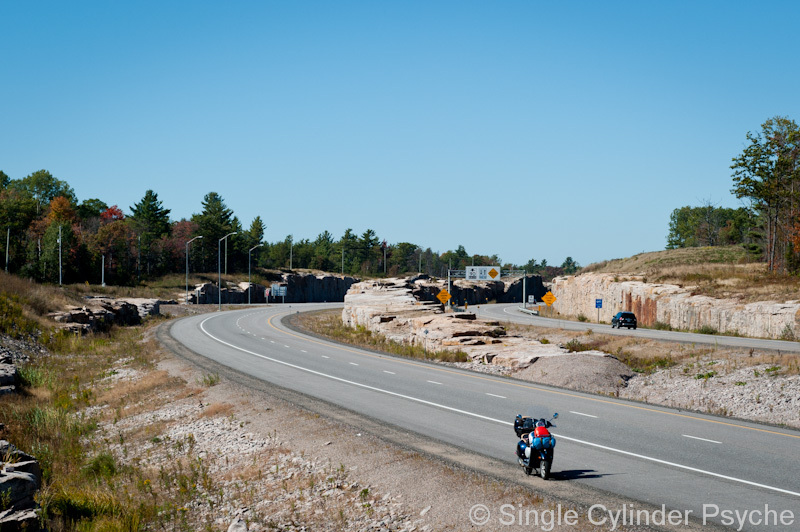 Today I rode on Trans-Canada Hwy’s 50 miles east to Sudbury, then 300 miles south to St. Catherines. All Ontario. It was beautiful scenery, but it had the feel of a US interstate to me. The few towns along the way were for the most part stopovers for travelers to eat or sleep. 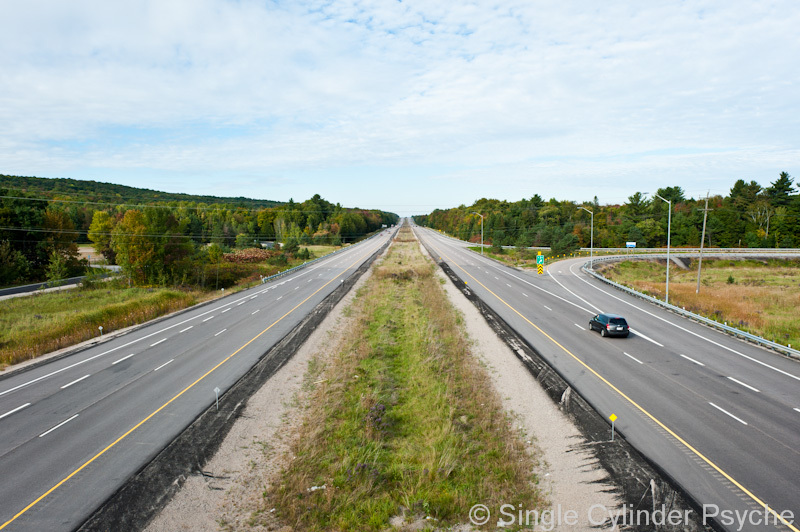 The road south from Sudbury was crowded and the drivers aggressive. It took me a while to realize that it was Sunday afternoon and the vehicles toting boats and bicycles, ATV’s and jet skis were racing back home from a weekend in the northcountry playland. It reminded me of California. I’m anxious to get back to small-town America. I’m happy tonight. I’m at a Best Western dividing my time between typing this blog, doing laundry and watching the lunar eclipse. Tomorrow morning there’s a complimentary hot breakfast, and on Tuesday I’ll see Marion and Leah. Life is sometimes especially good. There are hundreds of rock persons and other rock art along the highway. 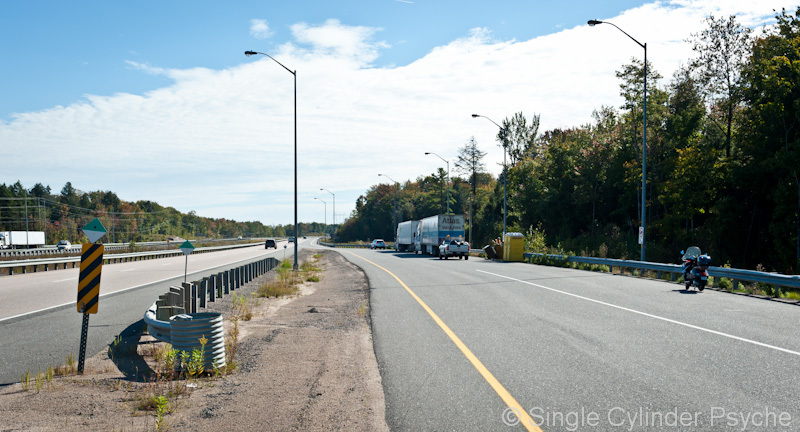 Ontario is lacking when it comes to roadside rests. There were very few, and they were nothing more than an off-on lane with a trash can and outhouse. You cut a very good profile for a tourist. Just sayin’. Wonderful photos. 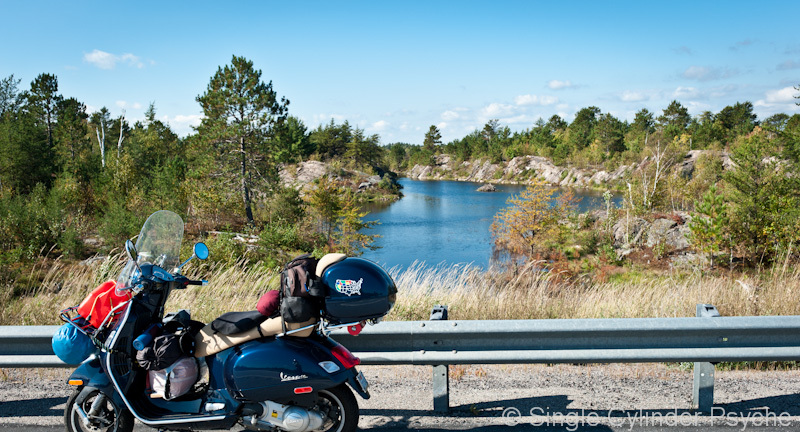 Only visited Ontario once in my life, many moons ago. (Visited Montreal much more recently.) Since I only recently got motorized again (rode off-road motos decades back), and Vespafied for the very first time, I’m not taking the long road for a little while, but your explorations are something of a gentle encouragement to keep thinking those more-excursive thoughts for when the time is right. Happy trails! “You cut a very good profile for a tourist…” It helps that the photo was blurry. I look better that way. 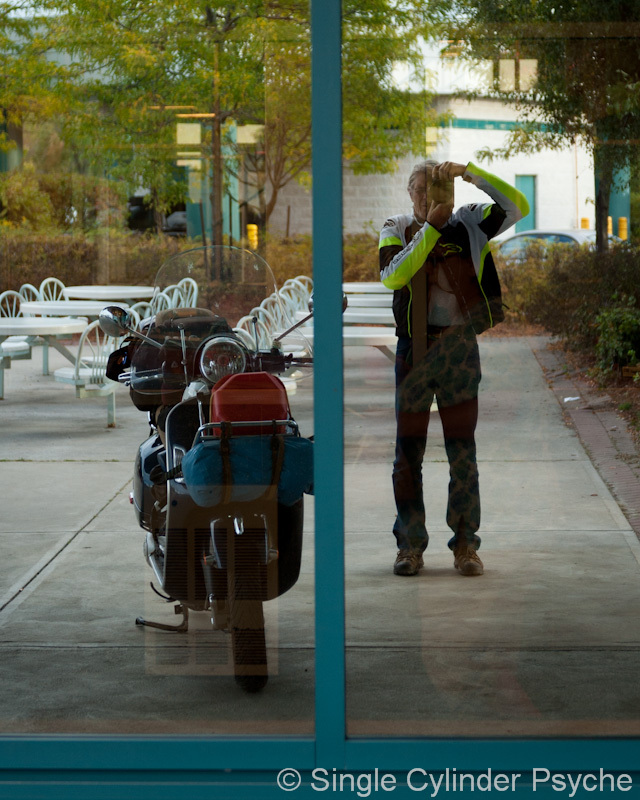 Alpinestars T-GP Plus R Air It’s a mesh jacket for warm weather but works well with layers. Good to see that US map quickly filling in with visited states since I last saw it in person, Mike. I am impressed with the miles you cover in a day and that you’re getting the packing/unpacking down to more of a routine so it’s less laborious. You seem to be finding great subjects for your photos, very enjoyable. Even the selfie. You deserve a Best Western now and then, as well. Best wishes for a happy visit with Marion and Leah. Say Hi for me. 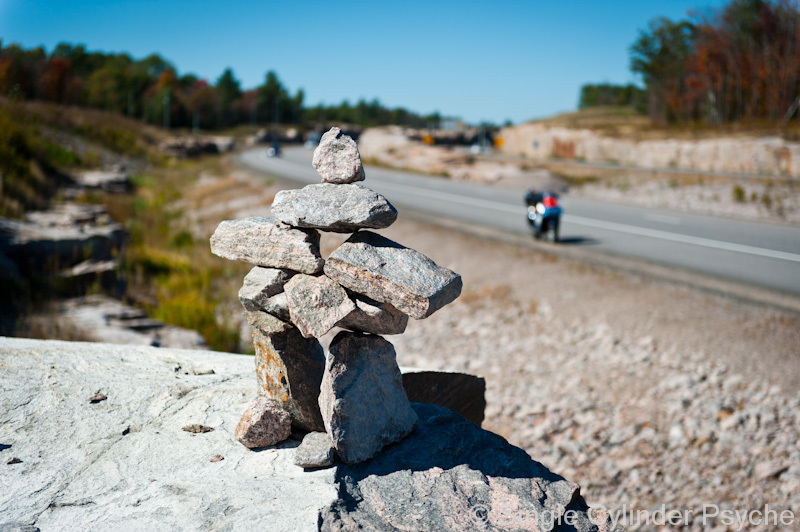 Mike, the ‘stone people’ are Inukshuks. They are decorative most everywhere, except the Arctic where the Innu people build them as guides in the barren landscape. They convey vital meaning there. Elsewhere, not so much.